As with most trips, I had done a little research before I began the drive to Charlottesville. Naturally, the many searches through local blogs, yelp, and chowhound included a look at what Asian cuisine Charlottesville had to offer. Throughout the searches, one name that kept popping up was Marco & Luca. Described as very bare bones dumpling shop, I was intrigued and wrote the name down but kept searching. However, when I actually made it to Charlottesville, I was meandering through the downtown pedestrian mall when I saw the familiar name. Feeling in the mood for an afternoon snack, I walked through the mall entrance and into the tiny Marco & Luca. There isn’t much in the way of selection at Marco & Luca. You have a choice of dumplings, noodles served hot or sesame, a hot pork bun, a veggie bun, and hot & sour soup. Since the noodles were strangely unavailable, I skipped the veggie bun and soup and went for pan fried dumplings and a hot pork bun. After a few minutes of waiting, my number was called and I picked up my cafeteria tray of food. This order consisted of seven crispy dumplings swimming in a thick sweet sauce. It tasted like a combination of hoisin sauce and Sriracha, sweet with a little spiciness. 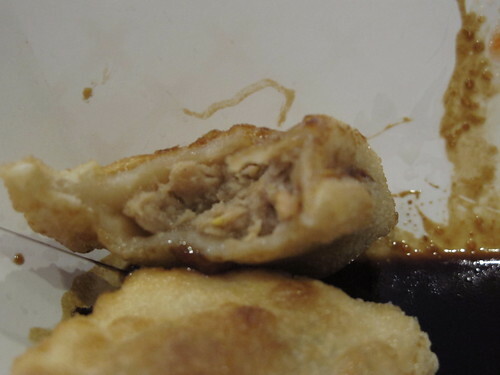 The dumplings had the usual pork and ginger filling and they were decent. I’ve read rumors that these are just Costco frozen dumplings and frankly, I wouldn’t be surprised. 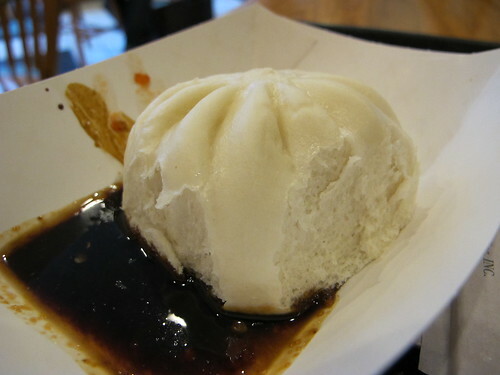 As for the pork bun, it’s another puddle of spicy, sticky sweetness. 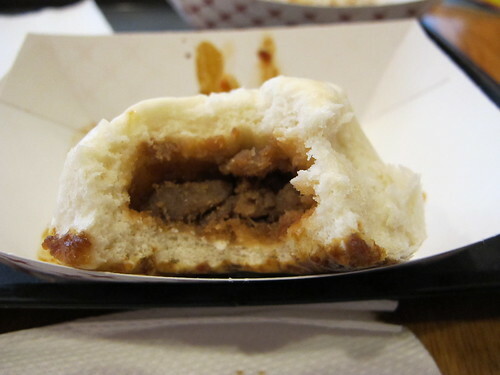 Biting into this pork bun, you get the familiar thick and pillow like texture, but I was surprised at the filling. Maybe I’ve been spoiled by the homemade masterpieces of Mrs. Yuan, but this filling was the driest I’ve ever seen. I definitely wouldn’t call it homemade char sui, but that type of sticky bun is a little harder to come by. Comparisons aside, the filling was meaty and a little bit spicy. While the bun was a great vehicle to soak up the sauce, there’s not much else can really be said about this sticky bun. Marco & Luca is by no means a goldmine for Chinese cuisine, but if you take it for what it is, a cheap, cash only dumpling & noodle bar that caters to a student crowd, it’s not that bad. Looking back at all the Chinese takeout I ordered in school, Marco & Luca is actually a little above average. In the future, I wouldn’t go out of my way to eat there but for a college student on a budget or anyone with a penchant for dumplings, it fits the bill. you must not have tried costco dumplings recently. these are nothing like it -- it's extremely rare to find so little wrapper for the filling. 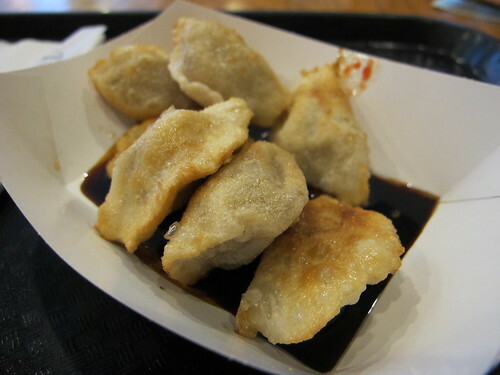 crispy on the outside, never oily, their dumplings are always fabulous.